What Shane can do for you! Detailed in all areas of estimates, inspections, diagnosis, consulting, problem solving, roofing, repairs, siding, windows, doors, gutters, financing, roof cleaning, ice dam removal and roof snow removal. In Shane’s downtime, he spends time with his wife (Teri) and daughters (Emma and Paige). He also enjoys gathering with friends and family, working out, snowmobiling, sports, yard work and discussions. 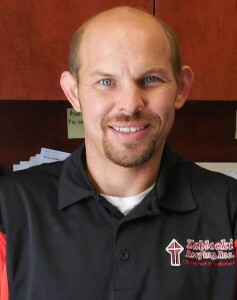 Zablocki Roofing was thrilled to be able to add Jon Miller to our team in 2012. 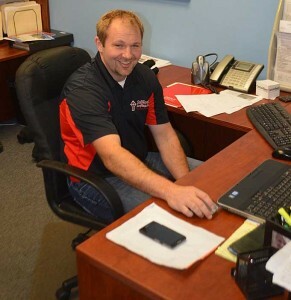 While Jon is primarily in sales, he has also available to work in the field installing roofs, siding, and windows. He is also a highly skilled repair technician, and is able to find and correct many exterior problems. What Jon can do for you! Jon is able to provide you with detailed estimates for roofing, siding, window and doors. He is also able to diagnosis roof/siding problems, make repairs – large or small. In Jon’s off time, he spends time with his wife and children. In the fall he enjoys hunting and in the winter he gives back to his community by coaching the Foley Youth Wrestling team. 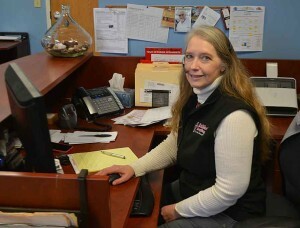 Diane Tuorila has been with Zablocki Roofing since 2009. Her main duties include, answering phones, keeping track of the necessary paperwork, product research and keeping the office running smoothly so the sales team and installation crews can do their jobs. Diane is usually your first point of contact with Zablocki Roofing. She will get your contact information and then direct you to the person best able to help you. Behind the scenes, she is responsible for making sure the appropriate permit(s) has been applied for, product has been ordered, and information has been shared with the crew assigned to your project. She is also responsible for completing all paperwork associated with your project. In her off time, Diane enjoys traveling, hot air ballooning, and genealogy. Diane has 40 states and 14 countries on her “visited” list and is always looking forward to adding more! We’re just a phone call away – call us at 320-203-1297!